In full expansion, and more and more used and put forward, in particular in the Anglo-Saxon countries, the Tiny House appears as the ideal solution for a pied-à-terre at a price defying any competition, or for a dwelling with simple, practical and ecological aspirations. Totally comfortable and with optimized proportions, this modern house on wheels, answers in every point the current urban planning needs: optimization of the space, durability of the habitat, adaptability and affordable prices. 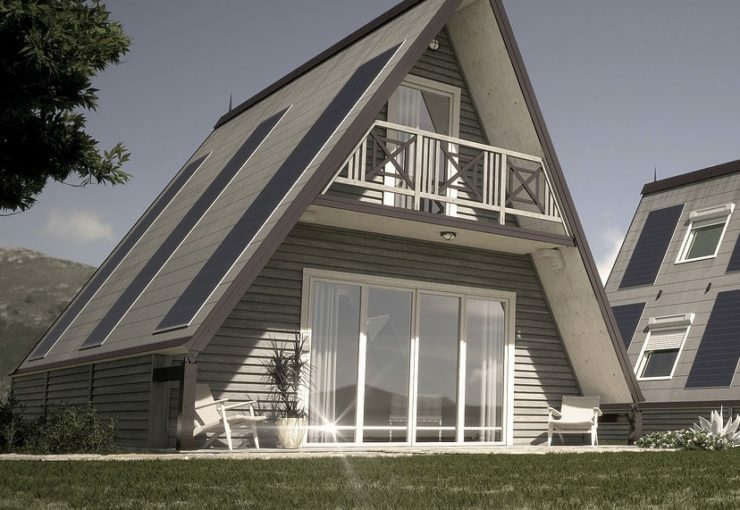 The Italian company M.A.D.I Home, has also turned towards the movement of small housing, in order to meet modern concerns, and has designed a range of Tiny House unfoldable, modular and customizable to infinity, for safe and quality buildings, permanent or temporary, to choose from. Focus on this revolutionary new home, at the cutting edge of comfort, for a house that can be adapted to your wishes and everything to your image! In addition to being ecological and in harmony with the environment, the Tiny House M.A.DI also meets other important needs such as modularity and customization while respecting the price code of micro-homes, so that your budget remains in total adequacy with your life choices! M.A.DI buildings are specially designed not to impact the environment. Removable and in order to be constantly in motion, these buildings do not need a base and foundations on the ground (no concrete…). If necessary, anchoring is provided by a new innovative foundation system, using piles screwed to the ground and fully recoverable at 100%. Once recovered, this pile system can be retained for future use. In terms of energy consumption, the Tiny House M.A.D.I (in their standard version) are of energy class B but, on request, they can easily become class A and A ++. Moreover, for an ever more advanced and useful pledge of ecology, the addition of solar panels can make the Tony House M.A.DI energy independent. It should also be known that today, they are the only removable, recoverable and reusable constructions that allow a respectful connection with the environment. Designed on the basis of modular and completely removable panels, the Tiny House M.A.DI offer an innovative system of independent and “temporary” houses totally customizable. This system offers many typological solutions which vary according to the use of several modules and/or the use of different materials. The availability of modules of different sizes and the possibility of placing them side by side, laterally and in depth, make it possible to create interesting and increasingly innovative shapes and constructions. Thus, depending on whether you are a private individual or a professional, and depending on your primary need, it is possible for you to build residential units or public facilities as well as tourist villages or emergency camps of different sizes. The combination of modules of different widths also offers a wide variety of aesthetic and / or functional solutions (portico or loggia for example). 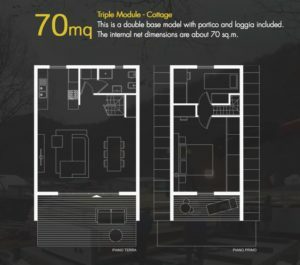 As standard, the Tiny House M.A.DI consists of at least two basic modules. 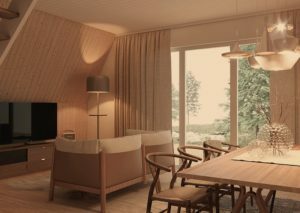 The internal organization of the spaces for this kind of models includes on the ground floor a living room with a staircase, a kitchen and a bathroom, on the first floor two bedrooms (accommodation for 5/6 persons). It is quite possible to change this organization and perfect it yourself according to your needs and desires! In most countries, you don’t need a building permit: the assurance of peace of mind, lower construction costs and significant time savings. The Tiny House M.A.DI offers the possibility of owning a temporary house where you wish or a permanent house in a construction area provided for this purpose, without expressly requiring a building permit. Indeed, even if it is a real residential building, with its deployment technique, a Madi construction can be compared to a mobile property. It is a so-called temporary construction designed to be closed quickly (it takes 6/7 hours with three workers) and moved to another location, in order to follow the needs of the owner. Because of this characteristic, Tiny Houses are not always subject to building permits, although it is preferable to seek permission from the municipality or competent authorities before committing themselves. However, the absence of a building permit does not affect the quality of these modular buildings: the buildings built with the Madi system are seismically certified and made with high quality materials. A lower cost of work for a quality and highly secure home. Because quality is the key word at M.A.DI Home, your budget is not affected. Indeed, the Tiny House can be habitable in two days: this means significantly lower operating costs compared to conventional construction work. Moreover, there is no need to call on different contractors to install the “basics” and others essential to your comfort: the Tiny House M.A.DI are equipped with pre-installed construction, water, sanitary, electrical, air conditioning (hot/cold) and drainage systems, as well as connections for the kitchen. Looking for a house that reflects your image, ecological, practical and modular? The innovation of the new modern, small and close to nature habitat attracts you? Succumb to the fully customizable and infinitely removable Tiny House M.A.DI, creating an innovative and revolutionary new home in today’s market. Trust the quality of M.A.DI buildings to create a house without environmental impact, which reflects the wishes of modern times, where everything changes and moves constantly. Just like you! Take pleasure differently and enjoy a simpler life choice to give time to yourself and others!